Mandarin Chinese exhibits two paradigms of conditionals with indefinite wh-words that have the semantics of donkey sentences, represented by ‘bare conditionals’ on the one hand and ruguo- and dou-conditionals on the other. The bare conditionals require multiple occurrences of wh-words, disallowing the use of overt or covert anaphoric elements in the consequent clause, whereas the ruguo- and dou-conditionals present a completely opposite pattern. We argue that the bare conditionals are cases of unselective binding par excellence (Heim 1982, Kamp 1981) while the ruguo- and dou-conditionals are most naturally accounted for with the traditional E-type pronoun strategy of Evans (1980). We thus argue partly for a return to the E-type strategy (along with Heim 1990) but maintain the need for unselective binding in UG (cf. Kratzer 1989, Chierchia 1992). It is further shown that these two paradigms do not differ with respect to the proportion problem and the distribution of symmetric and asymmetric readings of Kadmon (1987), though they differ with respect to ∀ and ∃ readings (discussed in Chierchia 1992) in a non-trivial way that provides further support for the proposed approach. Finally, evidence is given that the bare conditionals should be kept apart from correlative constructions in languages like Hindi, and treated differently from the latter. 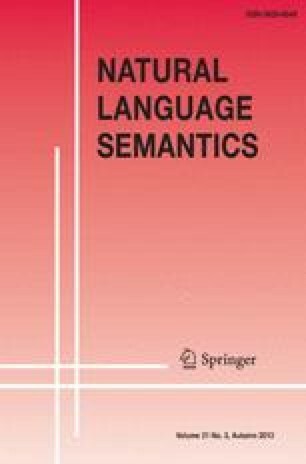 Various versions of this paper were presented at NACCL 4 at the University of Delaware, NELS 24 at UMass Amherst, the Conference on the Robustness of the Language Faculty at the University of Utrecht, and at colloquia at UCLA, Ohio State University, and the University of Oslo, the Chinese University of Hong Kong, National Tsing Hua University, and the University of British Columbia. We thank the audiences at these occasions for their valuable comments and useful suggestions. For the pleasant opportunity to discuss the materials with them, we are particularly indebted to Irene Heim, Gennaro Chierchia, Denis Delfitto, Viviane Deprez, Molly Diesing, Ken Hale, Christoph Harbsmeier, Ming-yang Hu, Utpal Lahiri, Jowang Lin, Anoop Mahajan, K. P. Mohanan, Friederike Moltmann, Waltraud Paul, Marie-Claude Paris, David Pesetsky, Tim Stowell, Anna Szabolsci, and Wei-tien Tsai. We would also like to thank two anonymous reviewers for their detailed comments and suggestions. During the research reported here, J. Huang was supported in part by an NSF grant, #SBR-9121167.